For me, the greatest joy of photography is the chemistry that arises in the making of a portrait. That image is the result of a three-way relationship between the subject, the photographer and the camera. Successful portraits result from that instant of collaboration. That moment when the subject connects and addresses the camera is often electric. There is a non-verbal communication between us and for that short time we are alone in the world, entirely focused on the task between us. At that moment I feel an energy – an actual rush – that is unique in my experience. I am often asked whether I tell my subjects not to smile, for their expression usually carries a message of seriousness. The answer is “rarely”. The seriousness you see arises naturally in recognition of the nature of the business we are about. Let me give you an example. 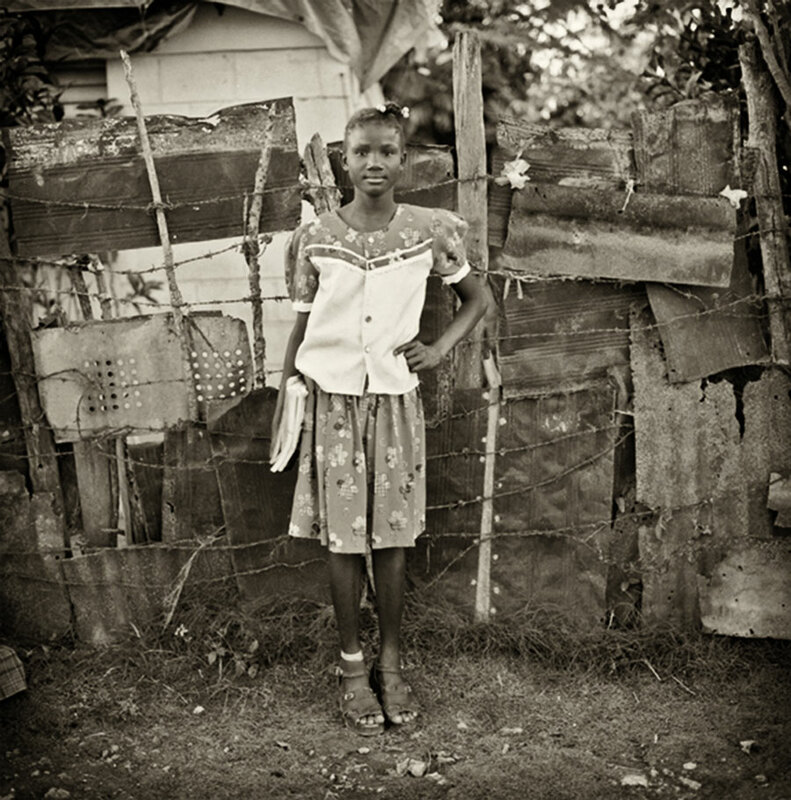 Here is a portrait made in a “batey” in the Dominican Republic. The bateys are small communities of Haitian people who come to work in the ocean of sugar cane that is cultivated north of the town of La Romana in the Dominican Republic. I was there working on a project with a number of friends including my buddy Bill. At the end of the day we drove into this particular batey so I could take some photographs. The instant my camera came out (my old trusty Hasselblad) we were surrounded by kids and adults alike. It was far too crowded and tumultuous to focus on any one person and I worried that our little journey was for naught. But Bill (who is a descendant of the Pied Piper) immediately engaged the crowd and lead them off down the road apiece. Left behind were just a few folks, including this young girl who was returning from school. She spoke no English and I spoke no Creole. Yet she instantly understood what this was about, and the result is the portrait you see here. I remain struck by her beauty, her self-assurance and her presence. To my eye she appears elegant, even when seen against the backdrop of barbed wire and rusted sheet metal. Most importantly, she has “engaged” with the camera. Her concentration is complete. ­­­­­And in the instant that I pressed the shutter I felt that rush once again.